Br Kieran Fenn fms presents the second of his three-part series on Mary in Culture as a contemporary form of Scriptural analysis. With the Emperor Constantine’s adoption of Christianity as a legal Roman religion, Christians felt an urgent need to clarify their ideas about Jesus as Messiah. As Mediterranean males ‒ the ones who did the theologising ‒ they were naturally concerned that the mother of Jesus was part of the project. Mariology developed from a Mediterranean male application of the principle that if something was fitting and proper to happen, then it did happen. How to speak of a human Messiah with a mother, not dropped from heaven? It was proper and fitting to call Jesus God, therefore it is proper and fitting to call Mary the Mother of God, which she must have been and therefore was Mother of God (Ephesus 431). But what good is her being Mother of God if she is dead and buried? So it is proper and fitting for Mary to have been raised after her death; therefore she must have been raised after her death, and in fact she was raised after her death. But it is equally proper she be taken to heaven after her death and being raised; therefore she was taken up to heaven and is in heaven right now. Once this principle of if it is proper and fitting, it must have been and therefore it was became accepted, it produced a large number of facts that allowed Marian devotees to seek out parallels in Jesus’ life and status for the life and status of Mary. If Jesus was poor and suffered, so too did Mary. If Jesus healed, so too did Mary. If Jesus was Lord, then Mary must have been a Lady of sorts. If Jesus is King, so Mary is Queen. In practice as we have seen in earlier articles, Jesus and Mary formed the male and female dimensions of the one God. Instead of judging people individually and psychologically, both elites and non-elites used stereotypical descriptions and explanations. So what stereotypical descriptions were fitting for Mary? How did she serve as a cipher for the feminine, specifically as virgin and mother? Mary was given a significant symbolic role to serve part of the prevailing religious system. On the basis of their cultural experience of the feminine, of virgins and mothers, Mediterranean theologians described the mother of Jesus in a way they felt necessary to fit into their system. Religion in their world was not a free-standing institution; there was no separation of religion and politics or religion and kinship. Doctrinal positions copied political ones. To say Jesus is God-man is within a context that saw the emperor as God’s single, human focus in the world, imbuing the role of emperor with divine attributes; after all, emperors are appointed by God, are they not? To say Mary is the mother of God is to say that she has the same role toward Jesus as the emperor’s mother or empress has toward the emperor. Much early art illustrates this. To say Mary is Queen is to raise the social level of queen to the supernatural, with subjects owing due respect. The same as saying Jesus is King. 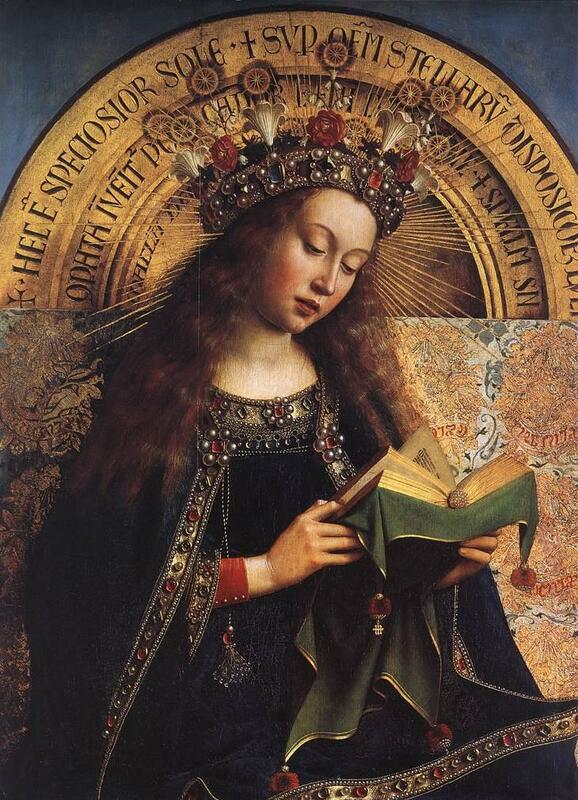 The Ghent Altarpiece – Virgin Mary (detail) by Jan van Eyck. To say Mary is a Lady is to raise the social level of the well-born aristocratic females of the Middle Ages to the supernatural requiring respect of subjects. With the rise of new religious orders, largely from aristocratic families, Mary was called the Bride of Christ, a Western male perspective on women’s religious orders that extolled the role of aristocratic virgins and projecting their role into the realm of the supernatural. Titles, experiences, and roles for Mary can serve the interests of those adopting the titles. Mary can be presented as the ideal mother, idealising motherhood, yet Paul VI points out the extended role that women perform in society (Marialis Cultus #34). The New Testament says little if anything about how Mary thought and felt. The Mediterranean male ideal drew on her ‘fiat’ and made her wonderful because she acted just like any male would want of a female, that is with full obedience to her church and her husband. Mary then devotes herself to her natural role of mother, with all the virtues natural to feminine nature (at least to the Mediterranean mind set): gentleness, docility, forbearance, submissiveness, humility, modesty, silence, obedience, long-suffering compliance, charity, prudence, compassion, purity, praise, docility. And of such is the controllable wife or daughter. None of this is in the New Testament but is a commentator’s idea of some ideal mother with attributes most often denied to normal womankind. One might also sense the origins of the litanies that preceded the Litany of Loreto, approved by Pope Sixtus V in 1587, with the suppression of all earlier litanies. The sphere of childrearing is nearly exclusively female. Boys stay with their mothers until it is time to move into the male world. Note how in Luke 2:48 it is Jesus’ mother who deals with him when he pays no attention to the caravan’s departure and goes missing for three days. When the father is no longer the subsistence provider for the family, de facto authority is now concentrated in the hands of the mother. In Mark 3:31-35 the family of Jesus comes with his mother to carry out the important task of taking Jesus home because ‘they thought him out of his mind’ (Mark 3:21). Source: Malina, Bruce. (1988). Mother and Son. Biblical Theology Bulletin. 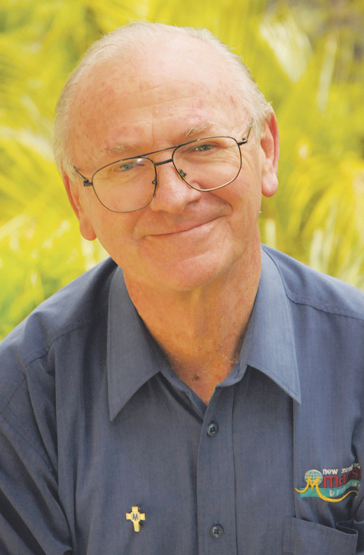 Br Kieran Fenn fms resides at the Columbian Mission Grove Outreach Community in Lower Hutt.